Muḥammad 'Abduh (1849 – 11 July 1905) (also spelled Mohammed Abduh, Arabic: محمد عبده‎) was an Egyptian Islamic jurist, religious scholar and liberal reformer, regarded as one of the key founding figures of Islamic Modernism, sometimes called Neo-Mu’tazilism after the medieval Islamic school of theology based on rationalism, Muʿtazila. He also wrote, among other things, "Treatise on the Oneness of God", and a commentary on the Qur'an. Muhammad Abduh was born in 1849 to a Turkish father and Egyptian mother in Lower Egypt (i.e. the Nile Delta). He also had Kurdish roots. His family was of the Egyptian elite. His father was part of the Umad, or the local ruling elite. His mother was part of the Ashraf. He was educated in Tanta at a private school. When he turned thirteen, he was sent to the Aḥmadī mosque, which was one of the largest educational institutions in Egypt. A while later Abduh ran away from school and got married. He enrolled at al-Azhar University  in 1866. Abduh studied logic, philosophy and Islamic mysticism at the Al-Azhar University in Cairo. He was a student of Jamal al-Din al-Afghani, a philosopher and Muslim religious reformer who advocated Pan-Islamism to resist European colonialism. Under al-Afghani's influence, Abduh combined journalism, politics, and his own fascination in Islamic mystical spirituality. Al-Afghani taught Abduh about the problems of Egypt and the Islamic world and about the technological achievements of the West. In 1877, Abduh was granted the degree of 'Alim ("teacher") and he started to teach logic, theology and ethics at al-Azhar. In 1878, he was appointed professor of history at Cairo's teachers' training college Dar al-Ulum, later incorporated into Cairo University. He was also appointed to teach Arabic at the Khedivial School of Languages. Abduh was appointed editor and chief of al-Waqāʾiʿ al-Miṣriyya, the official state newspaper. He was dedicated to reforming all aspects of Egyptian society and believed that education was the best way to achieve this goal. He was in favor of a good religious education, which would strengthen a child’s morals, and a scientific education, which would nurture a child’s ability to reason. In his articles he criticized corruption, superstition, and the luxurious lives of the rich. In 1879, due to his political activity, Jamal al-Din al-Afghani was exiled and Abduh was exiled to his home village. The following year he was granted control of the national gazette and used this as a means to spread his anti-colonial ideas, and the need for social and religious reforms. He was exiled from Egypt by the British in 1882 for six years, for supporting the Egyptian nationalist revolt led by Ahmed Orabi in 1879. He had stated that every society should be allowed to choose a suitable form of government based on its history and its present circumstances. Abduh spent several years in Ottoman Lebanon, where he helped establish an Islamic educational system. In 1884 he moved to Paris, France where he joined al-Afghani in publishing The Firmest Bond (al-Urwah al-Wuthqa), an Islamic revolutionary journal that promoted anti-British views. Abduh also visited Britain and discussed the state of Egypt and Sudan with high-ranking officials. In 1885, after brief stays in England and Tunisia, he returned to Beirut, as a teacher, and was surrounded by scholars from different religious backgrounds. During his stay there he dedicated his efforts toward furthering respect and friendship between Islam, Christianity and Judaism. When he returned to Egypt in 1888, Abduh began his legal career. He was appointed judge in the Courts of First Instance of the Native Tribunals and in 1891, he became a consultative member of the Court of Appeal. In 1899, he was appointed Grand Mufti of Egypt, the highest Islamic title, and he held this position until he died. As a judge, he was involved in many decisions, some of which were considered liberal such as the ability to utilize meat butchered by non-Muslims and the acceptance of loan interest. His liberal views, endeared him to the British, in particular Lord Cromer; however it also caused a rift between him and the khedive Abbas Hilmi and the nationalist leader Mustafa Kamil. While he was in Egypt, Abduh founded a religious society, became president of a society for the revival of Arab sciences and worked towards reforming al-Azhar University by putting forth proposals to improve examinations, the curriculum and the working conditions for both professors and students. He travelled a great deal and met with European scholars in Cambridge and Oxford University. He studied French law and read a great many European and Arab works in the libraries of Vienna and Berlin. The conclusions he drew from his travels were that Muslims suffer from ignorance about their own religion and the despotism of unjust rulers. Muhammad Abduh died in Alexandria on 11 July 1905. People from all around the world sent their condolences. I went to the West and saw Islam, but no Muslims; I got back to the East and saw Muslims, but not Islam. Muhammad Abduh argued that Muslims could not simply rely on the interpretations of texts provided by medieval clerics; they needed to use reason to keep up with changing times. He said that in Islam, man was not created to be led by a bridle, but that man was given intelligence so that he could be guided by knowledge. According to Abduh, a teacher’s role was to direct men towards study. He believed that Islam encouraged men to detach from the world of their ancestors and that Islam reproved the slavish imitation of tradition. He said that the two greatest possessions relating to religion that man was graced with were independence of will and independence of thought and opinion. It was with the help of these tools that he could attain happiness. He believed that the growth of western civilization in Europe was based on these two principles. He thought that Europeans were roused to act after a large number of them were able to exercise their choice and to seek out facts with their minds. His Muslim opponents refer to him as an infidel; however, his followers called him a sage, a reviver of religion and a reforming leader. He is conventionally graced with the epithets “al-Ustādh al-Imām” and “al-Shaykh al-Muftī”. In his works, he portrays God as educating humanity from its childhood through its youth and then on to adulthood. According to him, Islam is the only religion whose dogmas can be proven by reasoning. Abduh does not advocate returning to the early stages of Islam. He was against polygamy and thought that it was an archaic custom. He believed in a form of Islam that would liberate men from enslavement, provide equal rights for all human beings, abolish the religious scholar’s monopoly on exegesis and abolish racial discrimination and religious compulsion. Abduh regularly called for better friendship between religious communities. He made great efforts to preach harmony between Sunnis and Shias. Broadly speaking, he preached brotherhood between all schools of thought in Islam. However, he criticized what he perceived as errors such as superstitions coming from popular Sufism. As Christianity was the second biggest religion in Egypt, he devoted special efforts towards friendship between Muslims and Christians. He had many Christian friends and many a time he stood up to defend Copts. During the Urabi revolt, some Muslim mobs had misguidedly attacked a number of Copts resulting from their anger against European colonialism. Abduh also had meetings in Baghdad with the son of Baha'ism's founder and then spiritual leader, Abdu'l Baha, who he had a generally positive view of - although it was asserted by his students that he was unaware of the extra-Quranic religious scripture or status of Baha'ullah as a prophet in the faith and viewed it as a reformation of Shi'ism. Abduh's collected works have been compiled and published in five volumes by Muhammad Imarah. At the age of 28 Abduh joined a Masonic lodge, the Kawkab Al-Sharq (Planet of the East). Its members included Prince Tawfiq, the Khedive's son and heir, leading personalities such as Muhammad Sharif Pasha, who had been a minister, Sulayman Abaza Pasha and Saad Zaghlul. 'Abduh was asked why he and (his teacher) Afghani had become Masons. He replied that it was for a "political and social purpose". Like his teacher, Abduh was associated with the Bahá'í Faith, which had made deliberate efforts to spread the faith to Egypt, establishing themselves in Alexandria and Cairo beginning in the late 1860s. Rashid Rida asserts that during his visits to Beirut, `Abdu'l-Bahá would attend Abduh's study sessions. The two men met at a time when they had similar goals of religious reform and were in opposition to the Ottoman ulama. Regarding the meetings of `Abdu'l-Bahá and Muhammad 'Abduh, Shoghi Effendi asserts that "His several interviews with the well-known Shaykh Muhammad ‘Abdu served to enhance immensely the growing prestige of the community and spread abroad the fame of its most distinguished member." Remarking on `Abdu'l-Bahá’s excellence in religious science and diplomacy, Abduh said of him that, "[he] is more than that. Indeed, he is a great man; he is the man who deserves to have the epithet applied to him." (1903) Tafsir Surat al-`Asr, Cairo. (1904) Tafsir juz’ `Amma, al-Matb. al-Amiriyya, Cairo. (1954–1961), Tafsir al-Qur'an al-Hakim al-Mustahir bi Tafsir al-Manar, 12 vols. with indices, Cairo. (1962 or 1963) (Islamic year 1382), Fatihat al-Kitab, Tafsir al-Ustadh al-Imam…, Kitab al-Tahrir, Cairo. (no date), Durus min al-Qur'an al-Karim, ed. by Tahir al-Tanakhi, Dar al-Hilal, Cairo. (1966) The Theology of Unity, trans. by Ishaq Musa'ad and Kenneth Cragg. London. ^ a b c d e f g h i Kerr, Malcolm H. (2010). "'Abduh Muhammad". In Hoiberg, Dale H. (ed.). Encyclopædia Britannica. I: A-ak Bayes (15th ed.). Chicago, IL: Encyclopædia Britannica Inc. pp. 20–21. ISBN 978-1-59339-837-8. ^ "On Salafi Islam Dr. Yasir Qadhi". Muslim Matters. April 22, 2014. Retrieved August 14, 2017. ^ Ahmed H. Al-Rahim (January 2006). "Islam and Liberty", Journal of Democracy 17 (1), p. 166-169. ^ Hourani, Albert (1962). Arabic Thought in the Liberal Age. Great Britain: Oxford University Press. p. 130. ^ Hourani, Albert (1962). Arabic Thought in the Liberal Age. Great Britain: Oxford University Press. ^ Kedourie, E. (1997). Afghani and 'Abduh: An Essay on Religious Unbelief and Political Activism in Modern Islam, London: Frank Cass. ISBN 0-7146-4355-6. ^ Ahmed Hasan (July 2, 2011). "Democracy, Religion and Moral Values: A Road Map Toward Political Transformation in Egypt". Foreign Policy Journal. Retrieved August 14, 2017. ^ Gelvin , J. L. (2008). The Modern Middle East (2nd ed., pp. 161-162). New York: Oxford university Press. ^ a b Benzine, Rachid. Les nouveaux penseurs de l'islam, p. 43-44. ^ Juan R.I. Cole. Muhammad `Abduh and Rashid Rida: A Dialogue on the Bahá'í Faith. World Order Vol. 15, nos. 3-4 (Spring/Summer 1981):7-16. ^ "What did Muhammad Abduh do?". Arab News. Retrieved August 14, 2017. ^ Cole, Juan R.I. (1981). "Muhammad `Abduh and Rashid Rida: A Dialogue on the Baha'i Faith". World Order. 15 (3): 11. ^ Scharbrodt, Oliver (2008). Islam and the Bahá'í Faith: A Comparative Study of Muhammad 'Abduh and 'Abdul-Baha 'Abbas. Routledge. ISBN 9780203928578. ^ Cole, Juan R.I. (1983). "Rashid Rida on the Bahai Faith: A Utilitarian Theory of the Spread of Religions". Arab Studies Quarterly. 5 (2): 278. ^ Effendi, Shoghi (1944). God Passes By. Wilmette, Illinois, USA: Bahá'í Publishing Trust. p. 193. ISBN 0-87743-020-9. ^ Cole, Juan R.I. (1983). "Rashid Rida on the Bahai Faith: A Utilitarian Theory of the Spread of Religions". Arab Studies Quarterly. 5 (2): 282. Benzine, Rachid (2008). Les nouveaux penseurs de l'islam. Paris: Albin Michel. ISBN 978-2-226-17858-9. Black, Antony (2001). The History of Islamic Political Thought. New York: Routledge. ISBN 0-415-93243-2. Sedgwick, Mark (2009). Muhammad Abduh. Oxford: Oneworld. ISBN 978-1-85168-432-8. Watt, W. Montgomery (1985). Islamic Philosophy and Theology. Edinburgh: Edinburgh University Press. ISBN 0-7486-0749-8. 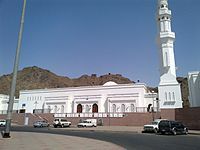 Wikimedia Commons has media related to Mohammed Abduh. This page was last edited on 9 April 2019, at 18:11 (UTC).